The garden grows fresh produce for the Lexington Food Pantry using the labor of volunteers from 14 houses of worship. Follen members work at the Lexington Interfaith Garden. Begun in the summer of 2010, Lexington’s Interfaith Garden, located near the Battle Green in Lexington Center, provides over a ton of free produce to local food pantries and hunger relief programs. Volunteers of all ages from over fourteen faith communities work and learn together while planting, tending and harvesting organically grown produce. Over time, the garden’s yields have increased, most notably with the addition of bees. The Interfaith Garden is also growing community – between the faith communities who are working beside one another in the garden and with our good neighbors who receive the food from the garden. Follen Church provides two volunteers twice a month to this project. No green thumb is needed. Show up and volunteer coordinator and long time gardener Carla Fortmann is able to direct the most inexperienced but willing worker. 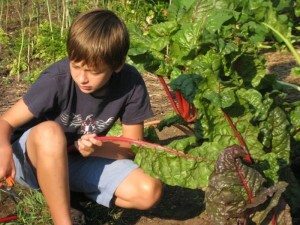 Many parents have enjoyed gardening together with their children. On Saturday mornings during the harvest season this locally grown produce is wheeled over in a cart to the Lexington Food Pantry where customers are eager to try food fresh from the garden. If you’d like to give it a try contact Janet Lane at garden@follen.org. For more information go to interfaithgarden.org.